here we go again with Snoopy. It seems that the cones are for men working, so Snoopy is telling us "Do not disturb, I'm working"
I think you are exactly right: a coned-off area is one you should not enter, and Snoopy is telling everyone to keep out while he eats. 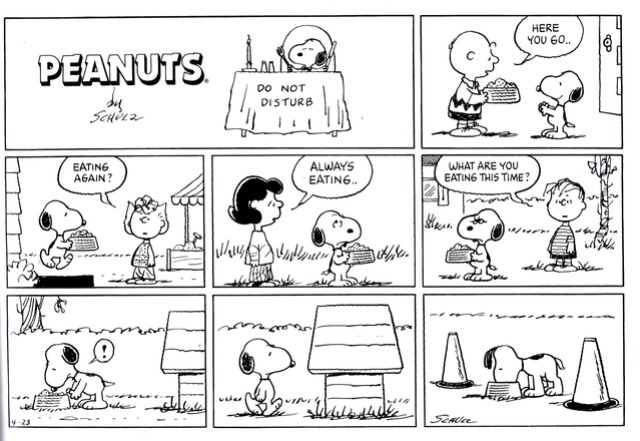 Yes, Snoopy's eating was one of the running themes of Peanuts, almost as much as his sleeping. For all his being "the only sane one" there, he was still a dog. Hello dancelover, sorry for the delay, I just read your post. An that's why it is so funny. In France, we call this kind of humor "Comique de décalage", I don't know how to translate it. Maybe "Comdey based on (gap - lag - shifting - difference - mismatch...)"